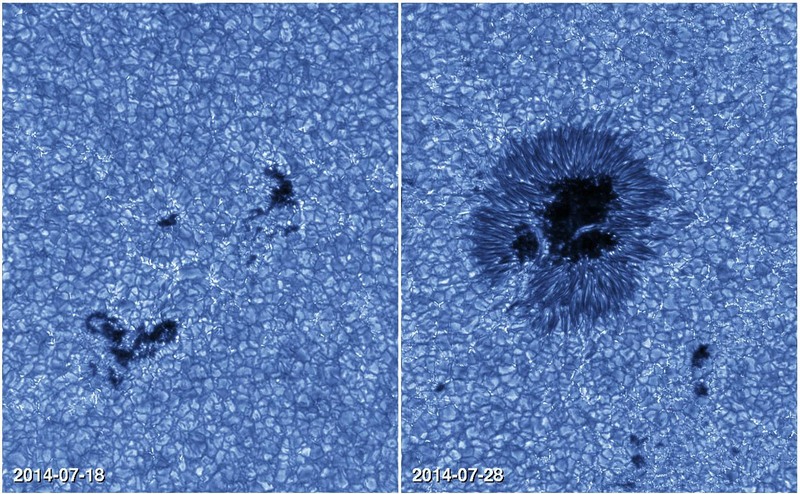 The image on the right shows the wavelength distribution and instruments at GREGOR foreseen for observations in season 2019A. We expect two pentaprisms to be available on a motorized rail. Depending on the selected pentaprism (they will be interchangeable within a minute), either all wavelengths > 900 nm or > 650 nm are available in GRIS. Note that only in the second case one can see H-alpha in the slitjaw imaging system. GRIS will be available as IFU in 2019A, while slit spectropolarimetry will be available in 2019B. Wavelengths below the cutoff of the pentaprism are reflected towards HiFI and GFPI. Another pentaprism cuts off the blue part of the spectrum towards HiFI. HiFI is available and commonly used with filters at 430 nm (G-band), 450 nm (continuum), or 396 (Ca line). The blue pentaprism can also be substituted by a mirror (if not using GFPI), in which case all wavelengths below 650 or 900 nm are available in HiFI if a suitable prefilter exists. The list of existing filters is available here. GFPI is offered only in spectroscopic mode and only in collaboration with AIP (no support from KIS). Layout of the GRIS spectrograph. The slit and polarimeter assembly exists on two interchangeable benches, one for the regular slit and one for the IFU. Image taken from Collados et al., AN 333, 872, 2012. GRIS (GREGOR Infrared Spectrograph) is the grating spectrograph installed at the GREGOR telescope. The spectrograph has a standard Czerny-Turner configuration with parabolic collimator and camera mirrors that belong to the same conic surface. Although nothing prevents its use at visible wavelengths, the spectrograph is mostly used in combination with the infrared detector of the Tenerife Infrared Polarimeter (TIP-II) in standard spectroscopic mode as well as for spectropolarimetric measurements. A slit scanner allows to scan some 60 arcsec, although scanning can also be performed with the AO. The slit length also corresponds to some 60 arcsec, with a sampling of 0.13 arcsec. GRIS+TIP operates in the range 1.0–2.3 μm, however the polarimeter is optimized for 1–1.3 μm and 1.5–1.8 μm. The experience at the German Vacuum Tower Telescope (VTT), located at the same observatory, demonstrated that the most used spectral regions are those at 1.083μm (including the photospheric Si I and the chromospheric triplet He I) and at 1.565μm (with a number of iron lines including a line with g=3). As an example for the 1.565μm region: Five accumulations of 30ms exposure time each in the 4 polarimetric states yields a signal-to-noise ratio of 1000. In this case one scan step takes 3 sec. The instrument paper can be found here. Starting in 2018B, GRIS is available in combination with the IFU built by the IAC. For a field of view (FOV) of 3" x 6" spatial and spectral information is then obtained simultaneously. The IFU is especially suitable for fast-cadence studies of a smaller FOV (e.g. evolution of granules), but it can also be used to scan across larger regions. The technical details can be found here. Changing the setup from slit-mode to IFU-mode requires maintenance time, and therefore the setup changes are minimized and only done between the two observing seasons. Examples of GRIS scans from previous years can be viewed at the GRIS data archive. GRIS is operated by the IAC. Manolo Collados is the Principal Investigator of GRIS. High-cadence imaging provides important context information for the observations. Small-scale magnetic features are more more easily detected in particular wavelength regions, e.g., the Fraunhofer G-band. Furthermore, the broad Calcium H and K lines offer chromospheric diagnostics. HiFI is operated with 2 sCMOS cameras, which are usually run at 47 Hz. Several interference filters (broad Ca II H λ396.8 nm, MPS Ca II H λ396.8 nm +- 0.1 nm, G-band λ430.7 nm, and blue continuum λ450.8 nm) are available of which two can be selected for the observations. The observers are responsible for their own setup, including selecting filters, focusing the cameras, and reading the manual for a proper operation of the instrument. All HiFI L1 and L2 data (i.e. higher-level data products) are stored in the GREGOR archive at AIP, where they can be accessed and queried on the website after registration. It is the observer's duty to reduce data (L0->L1), L0 data are deleted after a while due to their huge data volume. Fast processes on the Sun require instruments capable of acquiring data in a time span comparable to the evolution time-scale of solar features, which is on the order of minutes and sometimes even on the order of seconds. Imaging spectropolarimetry with the GFPI (Puschmann et al. 2012, 2013) is ideally suited for this type of application. The instrument comprises two tunable etalons in collimated mount, which provide a spectral resolution of ℜ ≈ 250.000. Scanning a spectral line takes a few tens of seconds to a few minutes depending on the sampling, the number of images acquired per wavelength position, and the observing mode (spectroscopy vs. polarimetry), however only spectroscopy is currently offered. Two cameras with 1376 × 1024 pixel acquire images strictly simultaneously in the narrow- and broad-band channels to facilitate post-facto image restoration including simple destretching, speckle masking imaging and deconvolution, and multi-object mult-frame blind deconvolution (MOMFBD). The field-of-view (FOV) is 50″ × 38″ in the spectroscopic observing mode and about half the size for polarimetric observations (25″ x 38″). 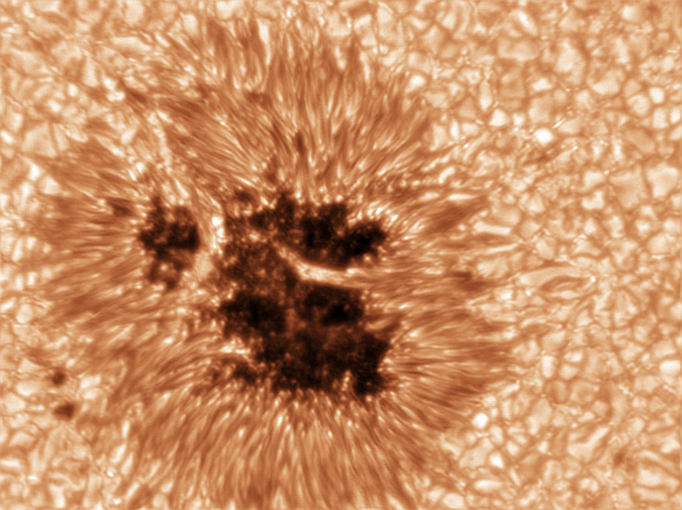 Small sunspots and substantial portions of active regions can thus be observed. The coatings of the etalons are optimized for the wavelength range 530–860 nm. Many interesting photospheric and chromospheric spectral lines are accessible, and two of them can be observed sequentially. GFPI can observe simultaneously with GRIS. The following restrictions exist for the 2019A season: GFPI is offered only in collaboration with AIP and only in spectroscopic mode. AIP is fully responsible for support. Only 2 spectral lines maximally 100 nm apart can be observed at a time due to the focus shift induced by the non-apochromatic lenses (they are off-the-shelf achromats). A current manual does not exist yet. Intensity variations exist in the continuum, which so far are not explained and are not calibrated. All GFPI data (i.e., raw data and high-level data products) are stored in the GREGOR archive at AIP, where they can be accessed and queried on the website after registration.